Metallic balloons are great indoors and can brighten the bleakest and most dreary winter day. They are great at birthdays, graduations and other special occasions. However, you must know how to use and dispose of metallic balloons properly, or you could cause a power outage and damage to utility electrical equipment. Because of the metallic coating, they conduct electricity well and can short out circuits in your community’s power system. You and your neighbors could lose power, traffic lights could go out, and entire blocks of homes and businesses could go dark. To prevent this, keep metallic balloons secured. When done with the balloons, deflate them and throw them in the garbage. Do not release them. Never tie a metallic balloon to a child’s wrist. If the balloon comes in contact with electricity, it will travel through the balloon and into the child. This could cause a serious injury or even death. 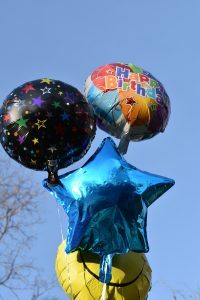 Metallic balloons have been known to float for several days before losing their helium and returning to Earth. If one lands within the fence of an electric utility substation, it can cause electrical fires and untold dollars’ worth of damage after high transmission circuitry goes down.